This is cute! Walmart has this Pete The Cat Ride 'n' Roll for $49.99 (Retail $62.99). Perfect for both boys and girls, Pete The Cat Ride 'n' Roll allows for a fun and friendly ride. Kids will love rolling and exploring on this ride with the groovy and adventure driven Pete The Cat. With built in comfort and fun, this easy-move, easy-transition and easy-wipe rider has four caster wheels that allow for easy riding. 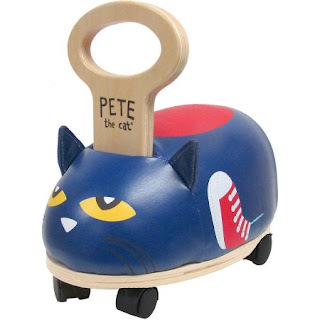 The ergonomic wooden handle imprinted with a Pete The Cat logo makes for a cool yet safe ride.